To find the most unique hotels around the world is not easy. I usually spend countless hours on the web searching and comparing. Often I will find that hidden gem with good value for money. Traveling around Colombia took me a lot of time to prepare. The first visit to a country it is hard to now where you want to stay. In the middle of our vacation, we planned to stay a few days in Cartagena. After careful research I discovered and booked Casa Lola. A small boutique hotel just outside the famous historic center of Cartagena. I like the small and not so touristic places and their pictures looked great. Even though they didn’t had a lot of reviews, every review was good. It was a bit over our budget, so we had high hopes. We flew in from Medellin where we stayed the first nights. Cartagena was just a complete opposite of the modern buildings we had seen in Medellin. The cab driver stuffed our suitcases in the back of his small car, which didn’t fit and had to be hold down by a rope. On our way to the hotel we drove past colorful buildings but also a few demolished buildings. It did not seems like a touristic area. The streets got more narrow and finally we stopped in the middle of nowhere. Ok this was it, the perfect place according to my research. Did I make a huge mistake? My party of 3 depended on me to book them the best places. I saw their faces and we thought this cab driver was mistaken.. The cab driver took off and we were standing in this small street with our suitcases. The hotel looked nice from the outside but there was no sign anywhere. Next door was a dilapidated building. We knocked on this beautiful wooden arch door. My heart was racing at this point. I spent all this money on a place and the first impression wasn’t the best at all. The door opened and I finally relaxed. We entered a beautiful designed front office, even better looking than the pictures. A tasteful interior design with art everywhere. I felt a big relief and with me the rest of our party. The receptionist welcomed us with a cocktail of our choice. The tension was gone, let the exploration of Cartagena begin! Each room in the hotel has it’s own unique touch. We stayed on the ground floor. A spectacular waterway with bridges leads to the hotel rooms. We had 2 rooms right next to each other. The rooms are all decorated with artwork by Colombian artists, some modern, some classic. In both of our rooms the showers were open air. Combined with plants, rocks, beautiful rustic walls, our shower experience was such a delight. Time to explore the rest of the hotel. I followed the waterway which leaded to a waterfall in the garden. Cozy and nice nooks surrounded by green lush trees and plants. A beautiful relaxing place to have breakfast. A small staircase leads to the upper deck of the hotel, which featured a small plunge pool. The hotel sits outside of the historic center, but you still feel like you are in a movie. Our first impressions were wrong. 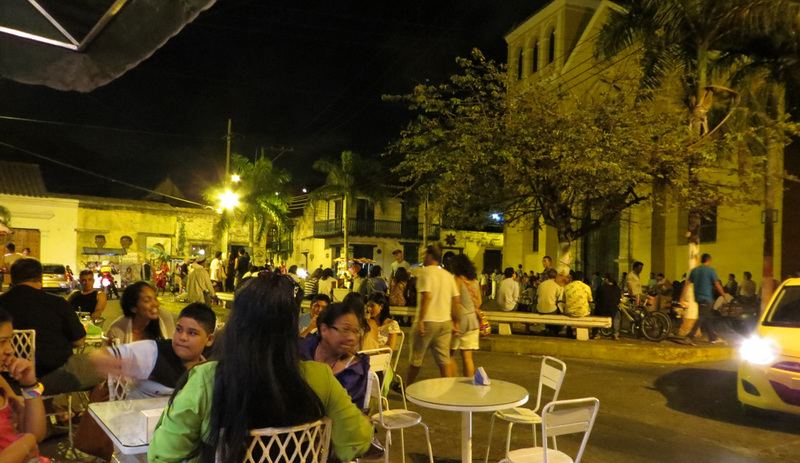 After spending a couple of days in Cartagena, it became clear that the city comes to life at night. In the daytime, you hardly see anybody on the streets. At night, the famous Cartagena doors open up and reveal the many fine restaurants, bars and galleries. On one street corner we found a notorious bar, having served famous clientele, such as Hilary Clinton. We imagined James Bond sitting there, sipping his cocktail together with CIA agents. At the other end of the street, we found a little square with hundreds of people gathering every night. Music, bars and cute little local restaurants. We ended up eating and drinking there quite a lot. We were the only tourists around, but it all felt safe. It is a short (cheap) taxi ride to get to the historic center. You can walk in about 15 minutes, while experiencing the smells, sounds and sights of the Cartagena street life. I would love to go back to this magical city with its friendly people and I wouldn’t stay anywhere else. Hotel Casa Lola was in all ways such a pleasure and a unique experience!